Guess what I can’t do while driving? Get angry. Flip people off. Swear at passing drivers. Speed up or down to prevent someone from getting over just because they made me mad at some point. I can’t scream out the window. Shake my fists. I can’t speed. I am prevented from even giving weird looks. Why? The back end of my van represents who I am. 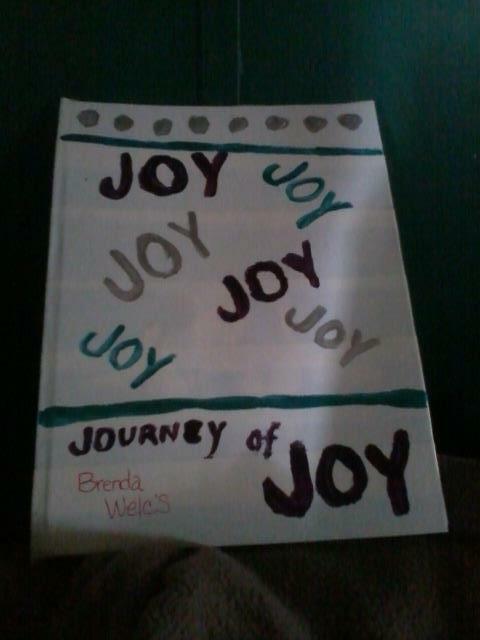 (for those who are seeing this without a picture go to brendafriendofjesus.com) I display for the whole driving world Who I am all about: God. 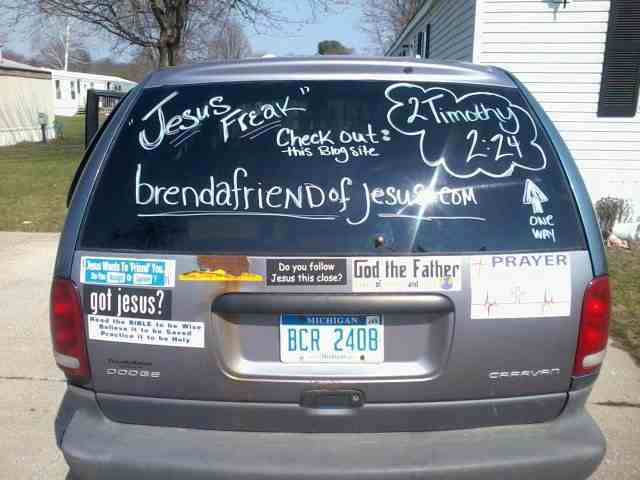 How can I even think about acting “Non-Christian” if I have “Jesus Freak” posted on the window of my van and a link to my website? This brings me to the point of this blog: Accountability. How many of us have said the sinners’ prayer so many times we know it my heart, with our eyes closed and in reverence about what we just did that was not very Christian? How many of us have stood at the bottom of heaven and asked for forgiveness for something dumb we just did while representing Jesus? We have to find a way to stop the cycle of doing the same crazy thing over and over again making us look like we really don’t have it all figured out. We know we are to refrain from swearing or acting unkind, yet in certain circles we find ourselves doing it. I am not claiming to be perfect because I am far from it, however, if we don’t change the atmosphere inside of ourselves, we certainly cannot begin to change it around us either. I already shared once how I was cured from flipping people off while driving when I happened to do it to a car which held one of my youth students at the time AND their parents. I was cured! I knew it was not right and I changed my behavior to save myself further embarrassment, however, for awhile after I still had mild cases of road rage where I would yell or curse but not loud enough for anyone to hear me…still the same. Since I started putting the bumper stickers on the back of my van, I changed my attitude towards other drivers and started blessing them instead. Then when I added the website and “Jesus Freak” I really began to realize how much of an impact I was making. I gained friendship via being parked at work and someone saw it and contacted me. People have gotten out of their cars in drivethru and taken pictures. I was driving down the highway and some drove by just honking and thumbs upping me only to have this man tackle me down at church a few Sundays later. What can you do today to make people around you aware that you are a Christian? How can you change the atmosphere where you are? Perhaps instead of putting your favorite team on your car window, you could put something which represents your faith. Bumper stickers are pretty permanent. You can wear clothing which represents your faith. Perhaps a pin or a hat. If you are truly following Jesus, don’t be afraid to stand out, we are suppose to be different, remember we are headed upstream! I challenge anyone reading this to go buy a paint stick for window writing and start today holding yourself accountable for being a follower. (post a picture if you can here on the blog or on my Facebook) I know for me it has held me back from getting angry when I drive and it also opens up opportunities for me to share Jesus with others. If “Jesus Freak” isn’t your style you could write “Be Blessed” or your favorite Bible verse. You never know how many lives you might touch in the process. We are here to shed Light into a darkened world, what’s a little writing on the window going to do? Perhaps save a life.